I’ve been on Facebook now since 2012 starting out with one small wonderful group of about 50 alcohol ink artists to much bigger Facebook groups with 34,000+ alcohol ink and/or mixed media artists. I’ve also enrolled 825 students so far this year, so I do think I’ve seen a lot and I’ve read a lot in that time. If you’ve taken my comprehensive e-course, Energy.Motion.Flow: The Beauty of Alcohol Inks and Beyond then you KNOW (boy, do you KNOW) that I address this very topic right in the Fundamentals section – before we even get started with opening those gorgeous bottles of ink! When new artists are starting out in their most vulnerable stage, finally getting the courage to post their art on line (yes, I know this is super scary), and tentatively posting their art in Facebook groups, they will often type the following set of words – hoping and praying that they will receive some type of formal critique of their art. “Which way do you like my piece?” (Giving two options for us to choose from). This always ends up with a 50-50 split. You MUST have seen these requests (heck – you might have made these requests yourself). You get the general idea. The new artist is looking for FEEDBACK, but actually is surely never going to receive what she is looking for. Well, for starters, most of us do not have the slightest idea of how to really give feedback or critique to another artist. We might not feel we know enough about the medium itself or that we are just starting out, too, or about 100 other reasons why we have no idea what to write. Oh, and time – who has time to really write a thoughtful critique? And, most of us did not go to a Fine Arts university and have not learned how to offer critique to another artist. Mostly, too, it is because we are not sure HOW to help because the artist asking the question has not given us any information that can help us. The request itself is all quite vague. Or “How did you do THAT?” (which, of course, isn't feedback, but actually asking the artist to share her technique). I guess you could call these comments, but I am thinking this is NOT what the artist is looking for. Normally, this piece of advice is given to my students in my e-course in both written form and in a video, but I feel such a responsibility to help all artists in their quests to be more empowered artists, that I’m giving you this advice for free. Your question may sound like this, "In this piece, I wanted to create a beautiful landscape. I am not sure if there is too much land and not enough sky. Is this piece too heavy at the bottom? Do you think I should crop this piece (cropping is definitely your friend). I was looking for a beautiful blue for the sky. Do you have any recommendations for a sky blue in alcohol inks”? Or, if it is a water scene, you might ask, “Is the horizon line in the right spot”? Or, “Do you have any suggestions for working with waves? That is a real opportunity for growth for me and I could use suggestions on how to make this one part of the piece better”. Perhaps you’ve created a beautiful bloom or flower piece. You might really like the petals on your flower but you are not sure about the stem and leaves. That is what you might say. “I really love (always talk nicely about your art) how I achieve a translucent layering with my petals on my flower. However, I do struggle with the stems. Do you think this stem is too thick (or thin) and could you offer any tips on making the right-sized stems”? Can you see the difference between the above questions asking for feedback as opposed to feedback welcomed? Here is the thing, my friends. YOU have to do some of the work, too. Critiques welcomed is never going to give you the feedback that you are seeking. Feedback needs to be a two-way street. You help them learn to help you! 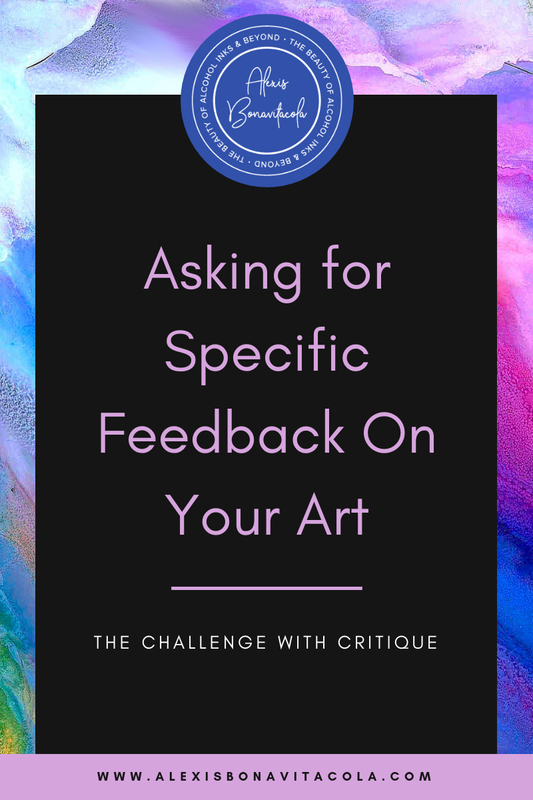 When you are able to look critically at your piece, think about what you really like about it, what is gnawing at you that you are just not sure about, then ask for feedback ONLY on the part of the piece where you need help. If you don’t do this, you risk other artists giving you feedback on a part of your painting that you absolutely LOVED! That is why, the more specific you are in your question about feedback, the better the feedback will be. It is up to you to put others in a position to help you. You can only achieve success when you guide them in a clear and specific manner. It is also invaluable to you as an artist to be able to view your art by focusing on what is successful about your piece and what needs improvement. One of the reasons I start out in the very beginning of my e-course with this information is that it sets my students on the road to feedback success. We all could use a little help from our “virtual” friends, but we have to do our part as responsible artists to be clear about we are seeking from others. Alcohol inks are messy. Anyone who has ever played with alcohol inks know that they are one of those mediums where it is just hard to keep everything neat. And, it is really difficult to stay within the lines! But, I tell my students. Why would you want to? When I hear another student comment about great control….I kind of cringe a little. Control? Why do we want to control this beautiful, fluid, and magical medium? Oh sure...don’t get me wrong. Every now and then you will see that I like to create more “controlled” floral pieces or blooms, but I’d say at least 90 percent of my art is about going with the flow. And I work with many students about how to let go and have fun with the inks. Many. They all want to control the inks, the outcomes, the masterpieces that they have in their minds. I’ve spent 20 years of my professional life in public and private school education. Over the years new ideas about learning and the ways students learn have come and gone but one that has stuck is the concept of the growth mindset. Carol Dweck, Ph.D., in her seminal work on a fixed mindset vs a growth mindset helps us understand that it is all about the attitudes we hold about whether we can continue to learn or not. It is about our mindset NOT our ability level.